Fire portends calamity. It carries at its core the mission to obliterate all that is in its way. It is inherently destructive and regenerative, making it ultimately an oxymoron. Poets and novelists have sung the praises of fire as an annihilating force that fuels passionate, romantic love—one that symbolizes a rebirth of sorts. In Greek mythology, Hephaestus, the god of fire, married Aphrodite, the goddess of love. To a pyromaniac, watching a fire they have set is said to be akin to sexual release. For Native Americans, fire is quintessential for cleansing the earth in order to grow new crops; it is through the marriage of earth and fire that life is created. Teresita Fernández’s 16-foot glazed ceramic wall panel, Fire (America) (2016) is a hypnotic installation daunting by virtue of its scale, and mesmerizing by virtue of its vivid color and heavy symbolism that abounds. From the title of the piece, we understand that the nocturnal landscape being devoured by flames is a metaphor for America—a nation that exists both as a place and fragmented vision, ultimately forming a fifty-state mosaic. The work however is not just a representation of the planet’s natural elements; it is a multi-layered replica of the earth and of the American continent, which unravels more and more the longer one spends with it. The scale of this installation renders it an immersive work, absorbing and transporting you to a deeper level of your psyche. Such is, after all, Fernández’s calling card. Known for her monumental installations, such as Fata Morgana (2015), a sculpture made of mirrors suspended above Madison Square Park—her largest public work to date—Fernández has mastered a multi-faceted understanding, interpretation, and construction of landscape. Embodying contemporary American violence, Fire (America) brings to mind some of the most horrifying narratives that have plagued the history of this nation. The title’s two words hint at the dark history of racism. The country’s past will always be tarnished with images of the K.K.K. burning crosses on front lawns in the dead of night. Its present continues to be tormented by instances of hopeless police brutality. The addition of 2016 inexorably recalls the explosive nature of a tumultuous election year that ignited a fire likely to burn for many years. And, as we all know, when flames wane, they leave behind a scorched soil. 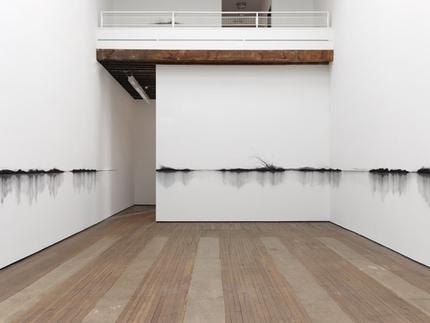 Fire (America) is complemented by another installation that commands the show: Charred Landscape (America) (2016), made of stacked charcoal stretching across the gallery walls like roots trying to escape from devastation. And as it traverses the gallery as a large-scale canvas, it renders the mood morose. The key here lies again in the choice of material: charcoal made by burning wood in the absence of oxygen. Superimposing the two installations creates a dialogue between life (fire) and death (charcoal). As the fire marries the night in this ardent installation, Fernández’s work comes across as undeniably poetic. Its power and beauty lie in its not-so-subtle political undertones. These landscapes are windows to our physical world as much as they are windows to our minds. Their visual effect is cathartic and pushes viewers to look back at the history of the land they’re currently standing on, and face the narrative surrounding how they’ve established themselves there in the first place.